It's where they cook in front of you, right there on the table, and it is delicious. This is still my favorite way to dine, for not only do you watch how your food is prepared but playing with food is strictly recommended. At Gasho, mealtime is showtime. After placing your order, a highly trained professional chef wheels out on a cart your uncooked dinner. As the ventilation fan above your head roars to life, so does the chef. He begins by throwing his weapons tools into air, tossing and juggling them, clanking them to a beat! Sometimes, if there are multiple chefs cooking, they sing together! The tricks don't stop with the knives. the fling around your food too! I'm very proud to say that I can catch projectile broccoli in my mouth from at least a five foot distance! I don't want to spoil all of the tricks for you, but these chefs get creative! They even catch debris in their hats. 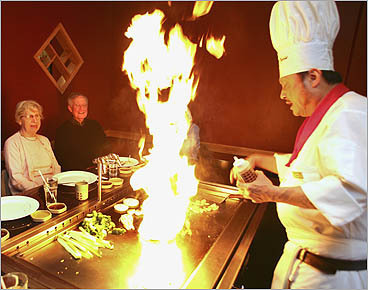 Of course, dining Hibachi will always be a treat, not just at Gasho. Gasho just so happens to be not only the home of some of the best hibachi I have ever eaten, but also a piece of living history. Aside from phenomenal food (have I mentioned that yet?) the grounds of Gasho feature beautifully sculpted landscape. Rock sculptures, a koi fish pond, even an old water mill. A midst the Japanese garden, there is a little hut. It is actually a private Hibachi room, with a round table inside! One day I will rent out that room. Gasho is located in many locations, apparently. The one I frequented is in Central Valley, New York. 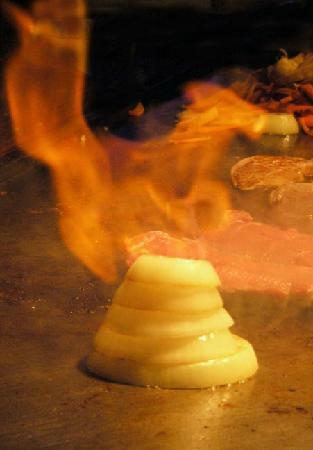 However, Gasho or not, you will never regret going to a Hibachi Steakhouse. Times change, and of course relocation happened again. We ended up in the small town of Monroe, MI, and happened across the lovely restaurant called Pete's Garage. 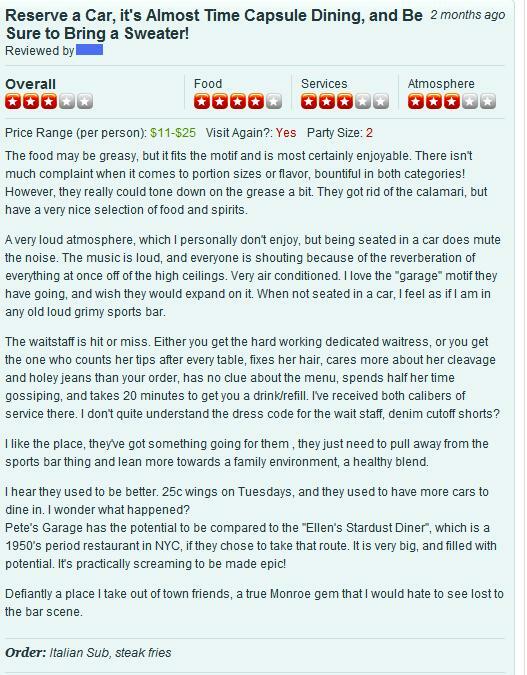 A screenshot of my ever so eloquent review of Pete's Garage on Restaurantica. I crossed out the name and took out the picture, to remain as anonymous as possible here, but you are more than welcome to creep if you so desire. And now, for the edited and revised version! I cannot believe I mis-spelled "Definitely"! Defiantly? All being said, dining on Thursdays is a solid tradition. I look forward to future restaurant endeavors! Do you have a specific day of the week, month, or year that you set aside to dine out? Where do you go? Who do you dine with? Have you ever been to either Gasho or Pete's Garage, and what was your experience? you need to try Jing Chuan in toledo as well as barada's. jing chuan is on secor and barada's is on monroe st. past the mall on the left. i think there's an indian restaurant somewhere near pier 1 also past the mall on the left but i've never been there so i don't know how it is. indian restaurants are either hit or miss.